Rolls-Royce has been contracted to deliver MTU engines and Kamewa waterjet propulsion units for three 42m high-speed, lightweight carbon fibre ferries for operation between Hong Kong and Guangzhou, China. The vessels will be built at the Brødrene Aa shipyard in Norway and are scheduled to be delivered to Hong Kong by June 2019. Rolls-Royce hat den Auftrag erhalten, MTU-Motoren und Kamewa Waterjet-Antriebe für drei chinesische Schnellfähren zu liefern. Die 42 Meter langen Karbonfaser-Fähren werden in China zwischen Hongkong und Guangzhou eingesetzt. Alle drei Schiffe werden von der Brødrene Aa Werft in Norwegen gebaut. Die Auslieferung ist für Juni 2019 geplant. Rolls-Royce Power Systems will equip three 42-metre high-speed ferries operating between Hong Kong and Guangzhou, China, with MTU 2000 diesel engines and Kamewa waterjet propulsion units. 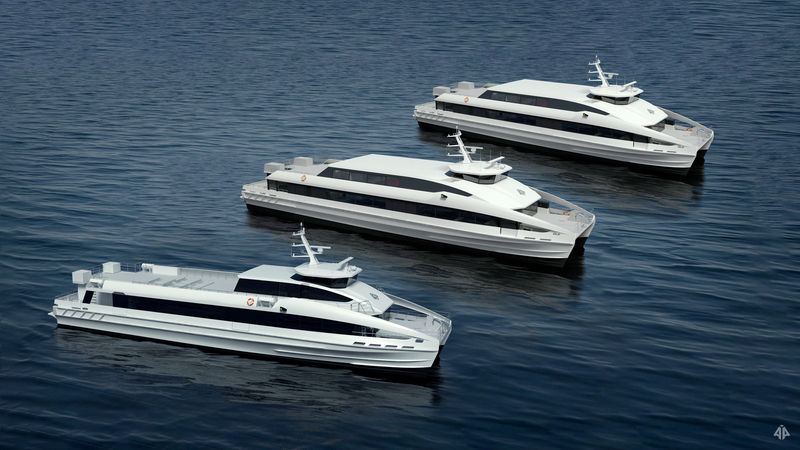 The ferries will be built at the Brødrene Aa shipyard in Norway and are scheduled for delivery by June 2019. The combination of the MTU 2000 diesel engines and Kamewa waterjets is claimed to offer the highest efficiency and lowest cost of ownership in the fast ferry propulsion market. The new ferries will be operated by Zhongshan-Hong Kong Passenger Shipping Co-op Co Ltd. Two of them will seat up to 300 passengers and operate at a maximum speed of 40 knots, featuring a quadruple Kamewa type S56-4 waterjet installation and four MTU 12V 2000M72 engines. The third will feature a 230-passenger capacity and a maximum speed of 37 knots: it will be powered by two MTU engines 16V 2000M72, each driving a type S63-4 waterjet. According to Tommi Viiperi, General Manager Sales at Rolls-Royce, this contract, along with the recent one with the Nordland Fylkeskommune county municipality, prove the high trust placed in Kamewa waterjets and MTU engines in both Norwegian and Chinese markets. “The products selected and choice of materials and technologies are made for creating unchallenged performance, durability and the lowest cost of ownership. The efficiency of both steering and reversing units, together with pump performance, help owners to reduce their operational costs. The features included in our equipment are much appreciated in today’s market where there is no room for compromise on performance or efficiency. The duplex stainless-steel construction of these Kamewa waterjets offers uncompromised durability compared with competing products. The fuel savings resulting from the highly efficient pump unit, combined with the design of the steering and reversing units, aids faster and more accurate manoeuvring,” said Viiperi. The Brødrene Aa yard, a world leader in fuel-efficient lightweight ferries, boasts extensive experience in composite construction, as it launched its first carbon fibre ferry back in 2002. The yard’s designs and construction techniques have been refined to meet the industry’s need for more efficient and lightweight ships, with lower emissions and reduced operating costs, without sacrificing safety and durability.